It's been a long 5 or 6 months since I last posted although come to think of it, it's actually flown in. I have been busy busy busy. Mainly been learning new skill-sets the past 6 months including additional Unity shenanigans but also an interesting move into 2D game development again. I've been using tools such as Stencyl which implements flash and now learning Game Maker as well. All decent and powerful tools. I'm hoping to build up a collection of small game prototypes in the space of a few months. I don't know if I ever announced this one but this was a game we built for the charity organisation Water For Africa. Made using Adobe Flash and in a group of a couple other people. Oh yes I had no job last time I wrote! I am now teaching a Games Design course for Clane College in the Republic Of Ireland so Whoop Whoop. I teach a crazy number of subjects including 3D, 2D, theory modules, game design and even a touch of web development. It has been a very difficult relocation with the crazy Irish accents and "yoyo" currency but great fun all the same. I am working in Limerick as a contract lecturer until September so back to the drawing board afterwards. I teach a talented bunch of wannabe developers. I am certain some of them will make it into indie game industry which is the next biggest thing for Ireland. I am bridging contacts with other Irish folks so hopefully I will have some good news in the months to come. Here is a very cool video to check out done by a student from my home-town. It's about the Irish Games Industry. Again maybe one day I will give this another go. I was getting really far into it. It was scary too! Slacking slacking slacking. I've been soo busy teaching that my 3D skills aren't developing any further. 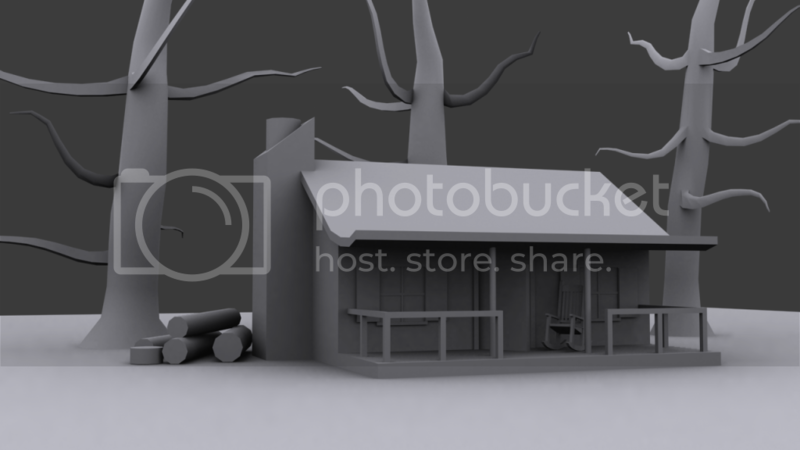 Been working on an Evil Dead themed environment. Texturing process is next. The trees are awful. They will be gone in the next update. I'm pretty much in the Mind-frame of modelling for mobile and tablet platforms which for me is the way forward. Outfitted with new gear like the Asus Z87 Pro motherboard, Intel i7 Haswell 4770k and a beefy new Nvidia GTX 770. A new power supply is coming tomorrow as the "Toughpower" is getting the boot. Some great stuff happening! Students and other indie projects. What I'm doing in Unity! So I've been playing around with Unity3D a bit! Pretty awesome tool in comparison to some others I have used! Pretty easy and intuitive way of working! Plus it works on my Macintosh too, meaning that I keep my projects on Dropbox (which don't use up a lot of space) and they open on my Mac or PC just fine! Me and some friends done this in about 48 hours of remote game jamming! It's a Infinite Runner Space Shooter type thing.. Not bad for around 48 hours work I think! Especially when we worked remotely using Google+ Hangouts! Then today I spent about 2 hours on some RTS camera stuff!! It's mainly not my code but just copying bits of free code here and there! Again, very primitive but it's functional! Again.. A rare blog update! So it's been a long long time since I last posted in here.. What's changed with me? So the last time I posted in here I said Dare was going great, it went really well! We made an awesome game and had a blast. We didn't win but who cares!! Here is our game trailer!! Moved back to Northern Ireland. I've applied to a lot of jobs but can't get one. Industry and teaching jobs. Only had two interviews!! TWO!! I might possibly be able to do some voluntary work with my local college in town. That would be great as they have invested a lot of money into a new creative technology studio which includes a motion capture studio!!! Getting back into game development. So the past 6 months nearly I've been in limbo and unmotivated but eventually I'm getting back into the swing of things. I'm currently working on single manned projects but I'd like to bring on board more people! One project is a Slenderman like horror game, another is a third person space driven game using Unity. Yes... I'm using Unity! And I have to say that it is awesome! Oh I forgot to mention that I have a Mac Mini too!! Hopefully I will be able to do some app development for iOS! I also done a game jam completely online with a few mates: Bradley, Aaron and Alastair! We made a side scroller in Unity and it can be played here on Bradley's portfolio website!! So that's it from me! I'm going to update this a lot more regularly with game and art updates! Just making an update telling you about what's been happening in the past few weeks..
Week 1 of D2BD is over, with week 2 starting tomorrow! It's been pretty good thus far, the university is really impressive with good equipment and support etc. The mentors from Blitz games and Cobra mobile have been great so I look forward to this week! I'm currently living in the halls of residence, the though of halls again is a bit depressing since I've been living in an amazing house for the past year but at least I don't pay for the bills and have an en-suite room. The rooms are very tall, classic Victorian style architecture so it gets really cold and because it is situated on a main road its REALLY loud at night. I haven't had a good night sleep for a good while now unfortunately. Ear plugs are helping! Lastly, I was waiting months and months for the new Macbook Pro lineup to arrive which did last week. I was disappointed to find there was only a 15" retina model and no 13" so if Apple follow suit I will be waiting till October in hope for a 13" retina model. It does look amazing though! Rant over, thanks for reading. SUP!.. It has been a long time since I have 'blogged'. Here are my biggest updates since September. Look! 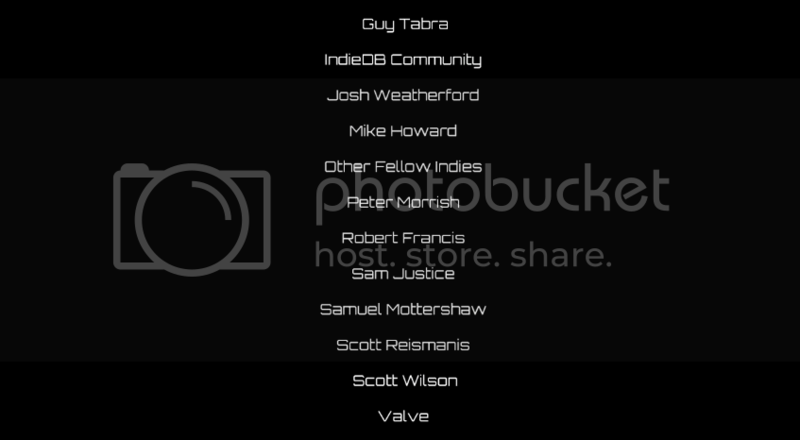 I'm in credits hur hur hur! I honestly didn't do that much with this game.. I was asked a lot to do scripting tasks which isn't part of my skill-set.. I was working on a cool hologram like effect but they decided to drop it =( Still though, I have met good contacts during my time with these guys!! Lastly, an environment piece I made using Zbrush, Max and UDK! I could have done soo much better for this and I'm not sure on how I will do for it! Spiral Games title which I worked on got released! Unfortunately it was extremely buggy on release! I would have prevented that! ;) but it's getting there with patches! Check it out on the steam store. I have yet again changed my portfolio website, design wise and content. 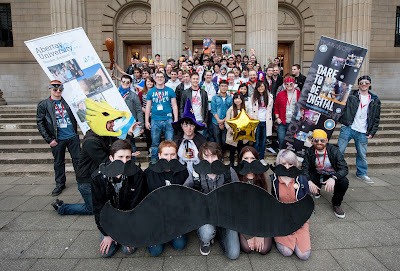 Me and some friends got into an amazing project called Dare to be Digital! Instead of telling you about it, watch this video! So all is well with that and I can't wait to tell more when I get to Dundee!! Hey guys! Again, it's been a long time since I've done a blog update! I've continued to work heavily with Spiral Game Studios and been making a massive impact on their game "Orion: Prelude" and have been offered a studio job. Here is some recent progress of the game! Note that Spiral Games have recently been at GamesCom and PAX! Was very busy times for our CEO.. I have now moved back to England to finish my university masters degree so hopefully that goes smooth along with my work with Spiral.. My main masters project will be based on creating a customisable character creation system for UE3 and I will post updates later in the year on that! That's it really! I also have two new blogs, one on the spiral game studios forums and one on the game dev forum! Links are below.. I just wrote my entire blog and the iPad decided to refresh the page :/ loosing everything. So what's changed since my last update? I'm now back in rainy Ulster with no hope of full time work :( out of the 8 or so studios I applied to, I only heard back from one, and that was a decline. On a happier note, I got my university results and passed with flying colours leaving only one year left to complete (postgraduate level)! Both are great projects and I get to use a lot of the UDK :D doing things from creating crazy creature rigs to implementing in game elements and features. Hopefully these projects will last until the end of the year which will give me some good industry experience for my CV and portfolio. I haven't been doing much to my personal website, but very soon I will be doing a major overhaul including more recent work and a "prettier" layout.